Wellesley's basketball, fencing, swimming and diving, and track and field team members were on campus during all or part of Wintersession for competitions in January. The basketball team had a super successful run, extending a winning streak to 11 games and winning all its Wintersession games until a three-point loss to Emerson on January 25. The Blue is 13-3 this season with a 10-2 mark in the NEWMAC, leading the league. See them in action against Babson on Wednesday, January 29, at 7 p.m.
Wellesley's basketball team also added community service to its Wintersession schedule, with the Let's Get Movin' program in Boston. Blue players and coaches visited four afterschool sites, playing basketball and leading other activities for children ages 8 to 14. Participants included head coach Jennifer Kroll, assistant coach Al Berger, team captains Leslie Leong '14 and Meghan Sargent '15, team members Katie Shulenberger '14, Natalie Anderson '15, Kendall Bianchi '15, Morgyne Weaver '15, Alex Berman '16, Chelsi Scott '16, Terrace Clark '17, Ailis Hanley '17, and student assistant Tya Logan. Let's Get Movin' is a lifestyle-change program for children and teens that promotes physical activity, teaches proper nutrition, and helps young people make healthy lifestyle choices. 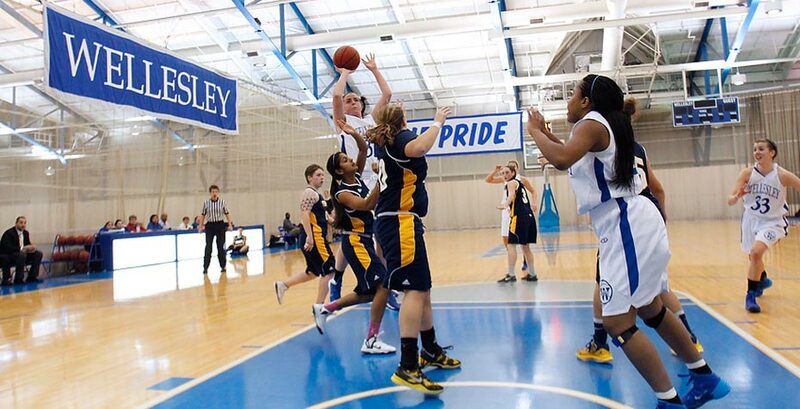 Wellesley basketball alumna Malia Maier '13 serves as a team leader for the Let's Get Movin' program. The team split up into four groups, starting off the day with an introductory game. They later taught the children the Wellesley basketball warm-up and conducted a relay race for the cardio portion of the day. For the latter half of the program, which is dedicated to playing a sport, the Wellesley team introduced the children to basketball. The children moved from station to station, learning skills like defense, shooting, dribbling, and passing. They ended the day with a fun basketball obstacle course. Participant Meghan Sargent said, "It was great to have the opportunity to share my love of basketball with children and to teach them some of the basics of the game. They were all extremely eager to learn and their enthusiasm reminded me of why I began to play basketball in the first place. Working with children and having the chance to volunteer in the local community was a very rewarding experience. I hope to be able to do something like this again in the future." The Wellesley College fencing team posted a 2-1 record, competing at the Blue's home invitational on January 26. Wellesley grabbed wins over Mount Holyoke College and Boston University, but fell to Tufts University, who went 3-0 at the event. Fencing also competed against Brandeis during Wintersession, on January 22. Squash players returned early to campus for competition, but the first matches, scheduled for January 21, were postponed because of snow. But the team went undefeated at the 2014 Smith Invitational on January 25, picking up three victories. The Blue topped Smith, Colgate, and William Smith at the event. Those results improved Wellesley's season record to 8-5. Wellesley's swim team traveled to Puerto Rico for a training trip. Team members ended up having to spend four extra days there because of flight delays with the big winter snowstorm! Because of the delays, two Wintersession home swim meets scheduled were cancelled. The extra training must have paid off: The swimming and diving team won its 17th-consecutive Seven Sisters Championship on January 19, and earned its 24th title overall. The team won three events on the final day of competition at Vassar. And on January 25, swimming and diving cruised to a 183-110 win at Mount Holyoke. The victory lifts the Blue to 4-1 in dual meets this season. Wellesley's track and field team opened the 2014 portion of its indoor schedule with a fifth place finish out of 12 teams at the Tufts University Invitational on January 18. It continued competition at a pair of meets the following weekend, sending eight athletes to the Boston University Terrier Invitational on Friday, and then competing at the Smith College Benyon Invitational on Saturday. At Smith, Wellesley placed fourth overall out of 10 schools, posting a pair of victories and 12 top-five finishes at the event. At BU, Blue first-year Mary Keenan hit a top-25 national time in the 3,000-meter race to lead the Blue.